This cozy vegan pot pie is made with tender veggies simmered in savory herbed sauce and baked up under a flaky pastry crust. 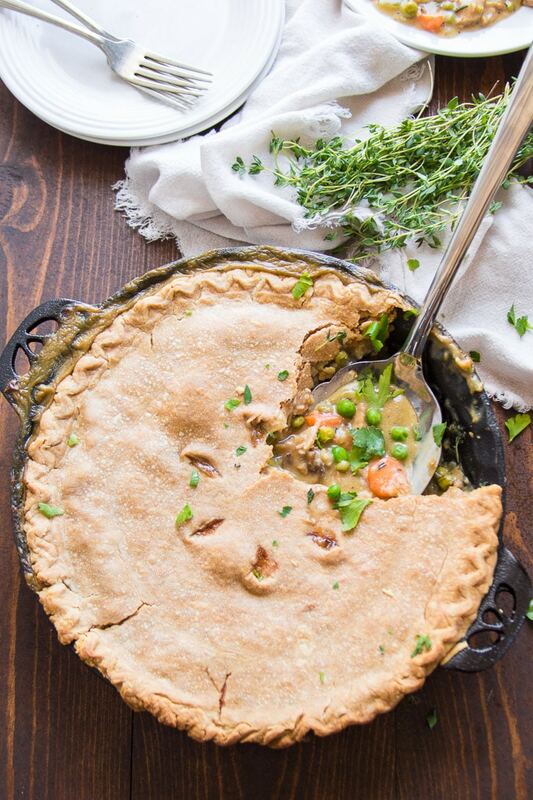 Tastes just like classic chicken pot pie, but this one is totally meatless and dairy-free! Some things I tackled right away. I was all about the Reuben sandwich, so much that I’ve blogged four versions of it. Others took a bit longer. I was never a big fan of meatloaf, but eventually figured out that I love it when it’s vegan. The idea of making a vegan chicken pot pie took a little while for me to warm up to. I think I only actually ate chicken pot pie once when I was kid, and I guess I wasn’t that impressed, because I did give up meat and all by the time I was thirteen. Finally, after six years of blogging, I decided to give it a go. And I think I did a damn fine job! So, pot pie! There’s a lot of directions you can take when putting together a vegan chicken pot pie, but with this version I opted to stay as true to form as possible, and instead of creating a fun vegan chicken pot pie with a twist, I simply veganized classic vegan chicken pot pie.